By the middle of 1941 international developments had heightened the tension between the United States and Japan and made the defense of the Philippines an urgent problem. The Nazi-Soviet pact, followed by the German Army's march into Poland in September 1939, had destroyed completely any hope for a peaceful settlement in Europe. The events of the following year made it evident that the United States might soon be involved in war with the Axis in Asia as well as Europe. Denmark and Norway had been invaded by Hitler's armies in April, Holland and Belgium were conquered in May, and on 21 June France surrendered. Not long after, Japanese troops, with the acquiescence of the Vichy Government, moved into French Indochina. In September, Germany, Italy, and Japan concluded the Tripartite pact, and the following April, Russia and Japan reached agreement and signed a neutrality pact, thus freeing the latter for extension of her empire southward. American efforts to halt Japanese aggression in Asia had met with little success. On 26 July 1940 Japan was notified that the commercial treaty of 1911 would be abrogated. On the same day Congress granted the President authority to control exports to Japan. Immediately he put the export of oil and scrap iron under government license and banned the shipment of aviation gasoline to that country. By the early part of 1941 shipments of scrap iron, steel, gasoline, and other important war material from the United States to Japan had practically ceased. While the United States market was being closed to Japan, American economic support to China was increased. In November 1940 Chiang Kai-shek's government was lent $50,000,000 through the Export-Import Bank; by the end of that year loans to China had reached a total of $170,000,000. Despite these moves, perhaps because of them, Japan continued to exert pressure on the French and Dutch colonies in Southeast Asia to "co-operate" in economic matters. What the United States needed more than anything else was time. But Japan's occupation of naval and air bases in southern Indochina on 22 July 1941 gave warning that time was short. The Philippine Islands, already almost entirely surrounded, were now further threatened and America's position in the Far East rendered precarious. Measures to strengthen the defense of the Philippines could be put off no longer. Despite the recommendations of the chief of War Plans, the official reply to MacArthur's letter expressed a sentiment entirely favorable to the proposal. This reply was contained in a letter dated 20 June from the Chief of Staff to General MacArthur. In it Marshall told the Military Advisor that the War Department's plans for the Philippine Army were not as broad as MacArthur believed, but that the decision to close out his office rested with him. All that the U.S. Army planned to do at the present time, he said, was to train about 75,000 Filipinos for a period of from three to nine months, contingent upon the appropriation by Congress of the sugar excise and currency devaluation fund. 1. That the President, by executive order, call into the service of the U.S. for the period of the emergency all organized military forces of the Commonwealth. 2. That General MacArthur be called to active duty in the grade of Major General and assigned as commander of Army Forces in the Far East. 3. That $10,000,000 of the President's Emergency Fund be allotted to cover the costs of mobilization and training of the Philippine Army for a period of three months. 4. That the training program of the Philippine Army for an additional six to nine months be financed from the sugar excise fund, or from other funds appropriated for this purpose. The President's military order did not mention General MacArthur by name; it was carefully worded so as to place the forces in the Philippines under a general officer of the United States Army, "to be designated by the Secretary of War from time to time." The actual induction of Philippine Army units was to be accomplished by orders issued by that general officer. The War Department immediately followed up the President's action by establishing, that same day, a new command in the Philippines, with headquarters in Manila. This command, to be called U.S. Army Forces in the Far East (USAFFE), would consist of the Philippine Department, those military forces of the Commonwealth ordered into active service for the period of the emergency, and such other forces as might be assigned. At the same time, MacArthur was recalled to active duty, effective on 26 July, with the rank of major general, designated as the general officer referred to in the military order, and put in command of U.S. Army Forces in the Far East.13 With the establishment of USAFFE and the simultaneous induction of the military forces of the Commonwealth Government, the two separate military establishments which had existed in the Philippine Islands since 1935 were placed for the first time under one command. The recall of Douglas MacArthur to active duty at the age of 61 brought back into the U.S. Army one of its most able and experienced senior officers. Son of General Arthur MacArthur of Philippine fame, he had graduated from the Military Academy in 1903 as a second lieutenant of engineers. Since then his record had been one of rapid advancement and brilliant achievement. His first assignment had been in the Philippines as a construction officer and he had been aide to his father when the senior MacArthur was chief military observer with the Japanese Army in the war against Russia. In 1907 he served as aide-de-camp to President Theodore Roosevelt. After various assignments in the United States he was ordered to Washington in 1913 for duty with the Chief of Engineers. The following year he accompanied the Mexican expedition to Vera Cruz as assistant engineer officer. In World War I Douglas Mac Arthur's record was outstanding. Transferring to the infantry, he served as chief of staff of the 42d Division, the Rainbow Division, and as commander of the 84th Brigade of that division. He was wounded twice, served briefly in the occupation and returned to the United States in 1919 as a brigadier general of the National Army. That year, at the age of 39, he was appointed Superintendent of the Military Academy at West Point over a number of senior generals. From West Point he went to the Philippines where he commanded in turn the District of Manila and the 23d Brigade. In January 1925 he was appointed a major general and returned to the United States the following month. States where he commanded the Ninth Corps Area on the west coast for a month and on 1 November 1930 was appointed Chief of Staff, U.S. Army. He held this post five years before going to the Philippines as Military Advisor to the Philippine Commonwealth. On 31 December 1937, after thirty-eight years' service, eighteen of them as a general officer, MacArthur retired from the Army with the rank of general, to become field marshal in the Philippine Army a short time later. His return to active duty on 26 July 1941 was as a major general, his permanent rank before retirement. The next day action to promote him to the rank of temporary lieutenant general was initiated and approved two days later, effective 27 July. The immediate tasks facing General MacArthur were, first, to establish his headquarters and organize his command on an efficient basis; second, to induct and train the Philippine Army; and third, to secure the necessary supplies and reinforcements to put his forces on a war footing. The first task was quickly accomplished. From the small group of Army officers who had been detailed to the Office of the Military Advisor and from U.S. Army organizations in the Philippines, MacArthur secured enough officers to form a nucleus for his headquarters. By mid-August he had a small and highly efficient staff in Headquarters, USAFFE, located at No. 1, Calle Victoria, in the walled city in Manila. His principal staff officers were men who had been with him for some time. For the most part they were men in the prime of their lives. The chief of staff and deputy chief of staff were 47 and 46 years old respectively at the time USAFFE was organized and had already served under MacArthur for several years. All the officers on the general staff were under 50 years of age, and of the three special staff officers who had been requested specifically by name, the youngest was 43 and the oldest 52. For his chief of staff, General MacArthur selected the senior officer of the military mission, Lt. Col. Richard K. Sutherland. Entering the army as a private after his graduation from Yale in 1916, Sutherland rose to the rank of captain before the end of World War I. During the peace years, he attended the Infantry School, Command and Staff School, Ecole Supérieure de Guerre, and the Army War College. Conceded by most to be a brilliant, hard-working officer, he was selected for MacArthur's staff in 1938 after a tour of duty in Shanghai. Gen. George C. Kenney, who served with him for four years, remarked, "He knew so many of the answers that I could understand why General MacArthur had picked him for chief of staff." But he also noted that among Sutherland's traits were egotism and "an unfortunate bit of arrogance. "14 Promoted directly to brigadier general in August 1941, Sutherland remained MacArthur's chief of staff until 1946, rising finally to the rank of lieutenant general. 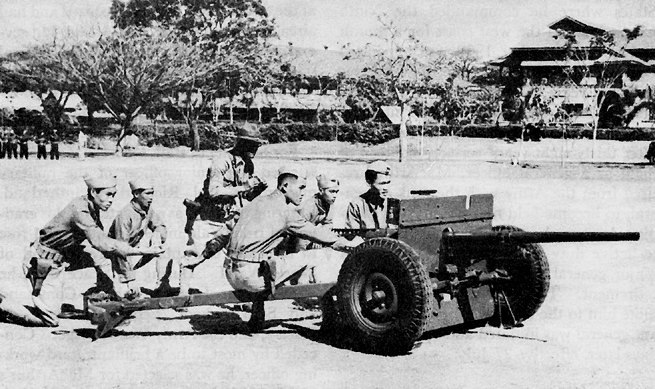 Field artillery components of the Philippine Division consisted of the two-battalion 24th Regiment (truck-drawn British 75- mm. guns) with 843 officers and enlisted men, and one battalion of the 23d, with 401 men and armed with 2.95-inch mountain guns (pack). Plans existed for the organization at a later date of the 26th Field Artillery and a separate battalion of 155-mm. guns for use with the division. The division also included the standard engineer, ordnance, signal, military police, medical, and quartermaster units. The total strength of the Philippine Division on 31 July was 10,473 men, distributed as shown in Table 1. The Philippine Division rarely functioned as a division, for its elements were scattered. Headquarters and the bulk of the division were at Fort William McKinley, just south of the city. The 31st Infantry was stationed at the Post of Manila, in the city itself, and a battalion of the 12th Quartermaster Regiment was located in the Manila port area. The 1st Battalion, less one company, of the 45th Infantry was stationed at the Post of Limay on the southeast coast of the Bataan peninsula. The rest of the division, including the artillery components, the 12th Ordnance Company, and a platoon of the quartermaster regiment, was at Fort Stotsenburg, about fifty miles north of Manila, close to Clark Field. a Includes 15 Philippine Scout Officers: 2 Hq, 2 Sp Trs, 3 45th Inf, 1 57th Inf, 5 24th FA Regt, 1 12th QM Regt, and 1 14th Engr. Source: Phil Dept, Machine Rcds Unit Station Strength and Misc., Officers and Enlisted Men, Jul 41. 1941 included the Harbor Defenses of Manila and Subic Bays, a cavalry regiment, two field artillery regiments, and quartermaster, signal, and military police units. The Harbor Defenses were commanded by Maj. Gen. George F. Moore, who had his headquarters at Fort Mills on Corregidor. They included not only the defenses of Corregidor, but also those-on Caballo Island (Fort Hughes), El Fraile (Fort Drum), and Carabao (Fort Frank)-all at the entrance to Manila Bay-and Fort Wint on Grande Island at the entrance to Subic Bay. The 26th Cavalry was a Philippine Scout organization with two squadrons of three troops each. It was considerably smaller than a similar regiment in the United States and had a strength of 784 enlisted men and 54 officers. 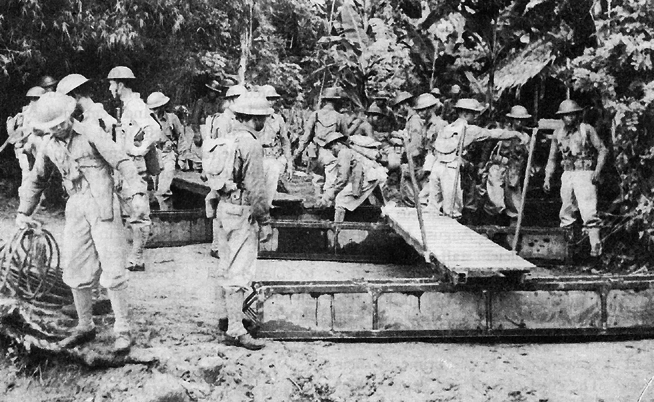 The home station of the regiment, except for one troop, was at Fort Stotsenburg; Troop F was stationed at Nichols Field, south of Manila.19 Also at Fort Stotsenburg were two Philippine Scout field artillery regiments, the 86th and 88th, the first with a strength of 388 and the second with 518 men. With the establishment of USAFFE, the Philippine Department became a subordinate command. 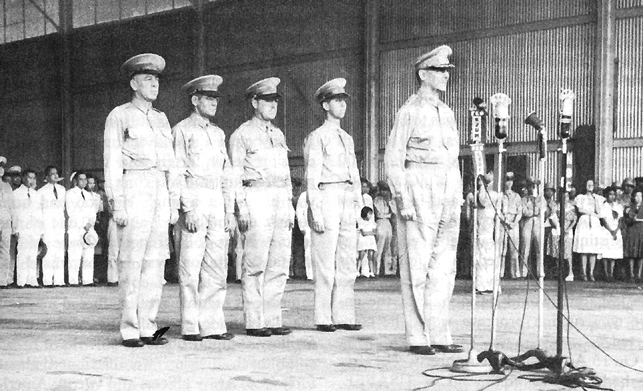 The headquarters staff was left largely intact, although General MacArthur designated some of its members to serve on his staff in addition to their regular duties, but the mission of the Department was narrowed until its principal task became the training and supply of the Philippine Army. In effect, it became a service command, "an administrative echelon," MacArthur explained, "analagous to a Corps Area. "22 Planning and the tactical control of field troops, organized into task forces, were now centered in USAFFE. a Includes 26 Philippine Scout Officers. b U.S. Army Mine Planter. c Includes officers and enlisted men for which no specific unit was indicated. Col. Harold H. George, Lt. Col. William F. Marquat, and Maj. LeGrande A. Diller. ters which had made the plans and preparations for war had no tactical control when war came. The major task of the hurriedly assembled staff of Headquarters, USAFFE, was to work out a plan for the mobilization, training, and supply of the Philippine Army. Within a few days of his appointment, General MacArthur had selected 1 September as the day when mobilization of the Philippine Army would start. This left thirty days in which to select camp sites, enlarge and improve existing camps for the first reservists, and build new camps. of pay, and promotion list; would requisition through their own supply channel until 1 December; but would be paid by the U. S. Army. The Regular Army of the Philippine Commonwealth and the Constabulary were not to be inducted immediately. Discipline in Philippine Army units left much to be desired, according to U.S. Army officers. Until war was declared there were no courts-martial. Since the Philippine Army retained its national integrity after induction, Philippine Army headquarters was responsible for discipline and punishment. Many of the officers and noncommissioned officers were untrained and unqualified for their assignments. There were some first sergeants and company clerks who could neither read nor write. The difficulties of mobilizing and training the Philippine Army can best be shown by following the experiences of a single division. The 31st Division (PA) was organized on 18 November at a camp near San Marcelino in Zambales Province, Luzon.35 An American Army officer, Col. Clifford Bluemel, who had commanded the 45th Infantry (PS) and later the staff and command school at Baguio, was assigned as division commander with a staff consisting of Philippine Army and Scout officers. When the division was organized, its camp was still under construction. The buildings were about 80 percent complete, and in the absence of a water system a few shallow wells were used. Work on sanitary installations had just begun. One of the division's regiments, the 31st Infantry (PA), had been mobilized on 1 September and was already in camp when Colonel Bluemel arrived. The 32d Infantry had been inducted on 1 November but did not join the division until 6 December. Starting on 25 November the third infantry element of the division, the 33d Infantry, began arriving in camp. Between 18 and 30 November, the medical battalion, motor transport, service, and division headquarters companies were mobilized. The signal company was organized on 1 December when a cadre which had been in training at Fort McKinley for three months arrived at camp. The 31st Field Artillery Regiment began mobilizing on 12 December, after the outbreak of war, and was finally organized with two battalions on 26 December, after the division had already moved to Bataan. ment. Every man was equipped with a rifle, the .30-caliber Enfield rifle used by American troops in World War I. The stock was too long for the small Philippine soldier and the weak extractor often broke and could not be replaced. Of the other infantry weapons, there was one Browning automatic rifle for each infantry company and eight .30-caliber Browning water-cooled machine guns for each machine gun company. Each infantry regiment had two .50-caliber machine guns and six 3-inch trench mortars, 70 percent of the ammunition for which proved to be duds. Artillery equipment for the division consisted of eight World War I model 75-mm. guns which were delivered to the division on the evening of 7 December, without sights Or fire control equipment. The 31st Field Artillery, therefore, could only organize two of the six firing batteries it was authorized. Organic transportation was virtually nonexistent. Division headquarters and the motor transport company could muster only one sedan, one command car, one bantam car, one 1½-ton truck and one ½-ton truck. The 31st Infantry had only one command car and eight 1½-ton trucks, which was more than the other regiments had. The division was deficient also in communications and engineer supplies, office equipment, spare parts, and tools. The personal equipment of the Philippine soldier in the 31st Division left much to be desired. His uniform consisted of shorts, short-sleeved shirt, and cheap canvas shoes with a rubber sole that wore out in about two weeks. Some of the men were fortunate enough to draw leather shoes. For warmth and protection against mosquitoes, the Filipino wore his blue fatigue uniform. There were no surplus stocks for issue or replacement. The division received no steel helmets, but did have gas masks. Rations were purchased by the individual organizations with funds furnished the unit commanders by the Philippine Army. Zambales Province, where the 31st Division was located, did not produce enough food for its own needs, and as additional units joined the division the procurement of food became a difficult problem. The division railhead scheduled to open on 1 December did not begin operations until a week later, after the war had started, because of the inexperience of Filipino supply officers. The training program of the division began theoretically on 1 September, when the 31st Infantry was mobilized, but it was not until 24 November that the men first fired their rifles on the target range at the Olongapo Naval Station. One battalion fired fifty rounds per man, and another twenty-five rounds. The third battalion never fired at all, for permission to use the range was withdrawn by the Navy when the 4th Marine Regiment arriving from China, was stationed at Olongapo. No other range was available for the division, and the one under construction was not completed when war came. The field artillery units received even less training than the infantry. As soon as the two batteries were organized, they fired two rounds per gun. Most of the men had never fired a 75-mm. gun and many had never even seen one fired. The engineer battalion had been constructing a road since its arrival in camp and received no other training. The cadre of the signal company was commanded by a Filipino who had received inadequate training at Fort McKinley. This man, who was to be division signal officer, was unable to establish radio communication with units a mile away in the same camp.